Eoin Doyle's first-half goal earned victory at Dagenham & Redbridge and kept Chesterfield ahead in the race for the League Two title. Doyle struck from close range after good work by Tendayi Darikwa to keep Paul Cook's side second, two points behind Scunthorpe with two games left. Marc Richards should have doubled the lead in the second half but his turn and shot went past the post. Luke Norris wasted a glorious chance to level but headed wide when unmarked. Match ends, Dagenham and Redbridge 0, Chesterfield 1. Second Half ends, Dagenham and Redbridge 0, Chesterfield 1. Attempt missed. Gary Roberts (Chesterfield) right footed shot from outside the box misses to the right. Nathan Smith (Chesterfield) is shown the yellow card. Foul by Nathan Smith (Chesterfield). Attempt blocked. Jay O'Shea (Chesterfield) right footed shot from long range on the left is blocked. Corner, Chesterfield. Conceded by Ian Gayle. Substitution, Dagenham and Redbridge. Luke Howell replaces Matthew Saunders. Attempt saved. Armand Gnanduillet (Chesterfield) right footed shot from outside the box is saved in the centre of the goal. Attempt saved. Liam Cooper (Chesterfield) right footed shot from the centre of the box is saved in the centre of the goal. Attempt missed. Marc Richards (Chesterfield) right footed shot from outside the box is too high. Corner, Chesterfield. Conceded by Gavin Hoyte. Attempt blocked. Medy Elito (Dagenham and Redbridge) right footed shot from outside the box is blocked. Attempt missed. Afolabi Obafemi (Dagenham and Redbridge) header from the centre of the box misses to the left. Substitution, Chesterfield. Jay O'Shea replaces Daniel Kearns. Ian Gayle (Dagenham and Redbridge) wins a free kick in the attacking half. Attempt missed. Luke Norris (Dagenham and Redbridge) header from the centre of the box is close, but misses to the left. Attempt saved. Daniel Kearns (Chesterfield) right footed shot from the centre of the box is saved in the bottom right corner. Lawson D'Ath (Dagenham and Redbridge) is shown the yellow card. Liam Cooper (Chesterfield) wins a free kick in the defensive half. Attempt missed. Marc Richards (Chesterfield) right footed shot from the centre of the box is close, but misses to the left. Foul by Afolabi Obafemi (Dagenham and Redbridge). Corner, Dagenham and Redbridge. Conceded by Thomas Lee. Attempt saved. Brian Saah (Dagenham and Redbridge) right footed shot from the centre of the box is saved in the centre of the goal. Substitution, Chesterfield. Gary Roberts replaces Dan Gardner. Attempt missed. 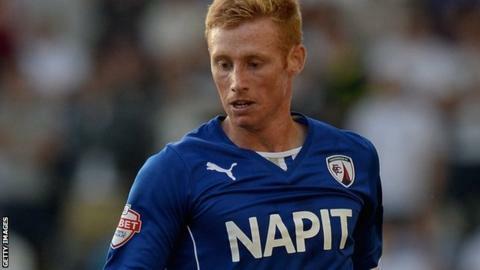 Eoin Doyle (Chesterfield) right footed shot from outside the box misses to the right. Substitution, Dagenham and Redbridge. Sean Shields replaces Billy Bingham. Substitution, Dagenham and Redbridge. Afolabi Obafemi replaces Blair Turgott. Attempt saved. Luke Norris (Dagenham and Redbridge) right footed shot from outside the box is saved in the centre of the goal.